Being a Femme Fatale is easy. Really – all you need are semi-presentable hair and wardrobe, along with an imperial ego. It’s when things start to slide off the rails that a gal needs a little help. Fortunately, a Femme Fatale troubleshooting guide exists in the 1946 film noir The Locket. 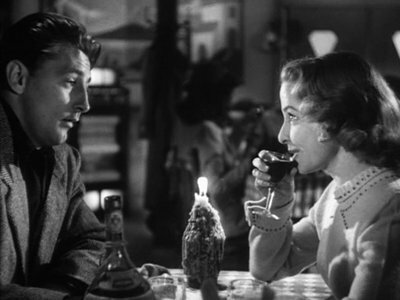 The plot, briefly: On the day of his wedding, a wealthy young man is visited by a stranger (Brian Aherne) who claims to be the ex-husband of the bride-to-be (Laraine Day). The stranger relates a troubling story about this woman, one that involves yet another man from her past (Robert Mitchum). The film revolves around the wholesome-looking Day, who gives an incredible performance as a woman who knows how to play all the angles. This makes her one of the great Femme Fatale figures, because she has Technique. She is able to remove herself from sticky situations by ducking behind innocent bystanders. Let’s examine Day’s technique. Are your pencils sharpened? Let us begin. 1. Always deflect blame. This is easier if you have a man who can absorb it for you. Remember, nothing is ever your fault. 2. Don’t flinch if an unwanted old flame suddenly reappears. Apply your prettiest smile to your face and say how thrilled you are to see him. Ask him to stay for a drink. Show everyone that you are the Bigger Person. 3. If a man from your past commits suicide, be sad and patronizing. Shake your head and wonder aloud about his emotional state. Be careful to not overdo it, though, or people might get the wrong idea about your history with the deceased. 4. If a man accuses you of a crime, act as though he’s gone soft in the head. Ask him if he’s feeling tired or stressed. If he persists with his story, put him in a mental hospital. Here you can be the Brave Woman who tearfully asks doctors if there’s Any Hope. 5. If your man tells you that an old beau has been to see him with wild stories of your past, admit to only innocuous facts. When you tell the story to your man, smile innocently, kiss him and place your head on his shoulder. “You don’t suppose he’s still jealous?” you might ask, as though you hardly dare entertain the notion. 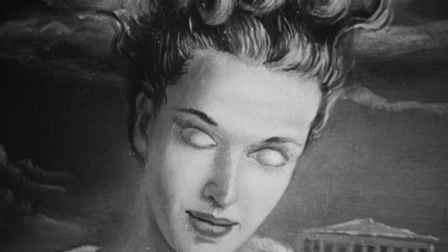 Bonus Point: If your man paints a less-than-flattering portrait of you (see above), pretend there’s no weird subtext. Refer to it as Art and boast about your boyfriend’s talent to every rich person you meet. You never know who you might meet while you’re networking. Even if you’re not interested in becoming a Femme Fatale, The Locket is required viewing. Not only does it have a clever script and inspired casting, it features a stunning performance by an underrated actress. The Locket: starring Laraine Day, Brian Aherne, Robert Mitchum. Directed by John Brahm. Screenplay by Sheridan Gibney. RKO Pictures Inc., 1946, B&W, 85 mins. What a marvelous post! These little nuggets of femme fatale how-to’s are priceless. I enjoyed this very much. Thanks, Kellee. While I was watching Laraine Day, it struck me that her character was a professional manipulator on every level. Laraine is too marvelous in this role. The bit about the less-than-flattering portraits will surely come in handy. Happens to me all the time. Oh no… Does that mean I might be a femme fatale? On another note, I sometimes wonder if these dames know they’re femme fatales. Like perhaps someone should do a series of pointers for figuring out whether you are that or the plucky gal Friday or love interest. Like maybe you think you’re the love interest but then BOOM! You’re accidentally the femme fatale! I feel like that happened to Cora in The Postman Always Rings Twice. Ha ha! Thanks for your excellent comment! That is an excellent point about Femme Fatale Self Awareness. I’d never thought about that before. I agree that Cora falls into that category. Ha ha – thanks! We both know it’s true. “A master course in femme” = I LOVE THAT! I found Day really disturbing in this because, as you say, she’s always the Nice Lady. But in this one, when she acts nicely, she’s downright creepy. Ha ha! That is quite a creepy portrait, isn’t it? It gives me the chills. As for Robert Mitchum, he is wonderful in this movie, isn’t he? He’s tough and sensitive and that scene where he visits the psychiatrist’s office has a shocking finish. I couldn’t believe he did that! Did NOT see it coming!! At what perfume counter can I purchase a bottle of “audacious confidence”? At this point I’m not above handing over the hard earned sheckles for some of the necessities of life in the fast lane. Ha ha – “audacious confidence” is a great name for a perfume. It’s certainly what a person would need in the fast lane. I love the ending, too! It’s quite a twist in a movie full of twists. And isn’t Laraine Day fantastic here? She’s wonderful in the “good-girl” roles but, for my money, this is her best role. Great post! Will definitely have to pick this one up! Thanks! It’s quite a ride, this film. So much happens that you can’t let your mind wander for a second. However, the movie is so riveting, that won’t be a problem. Where is my guide on how to deal with these girls?! It’s not fair if you teach everyone to act like Day, and then leave the rest of us helpless on the sidelines. I haven’t seen “The Locket” yet, but as a big Day fan I will be tracking this one down soon. Ha ha! That’s a good point about having a guide to deal with these kinds of gals. They do leave a lot of destruction in their wake. I hope you get a chance to see this. It does show up on the TCM schedule from time to time. Sounds like a must see! You had me at plot twists, and it sounds like there are plenty to be had. I loved your list of Day’s techniques – so funny! Can’t wait to see this one! There are INCREDIBLE plot twists in this film, including one at the end that I DID NOT see coming. I think there were two major twists in the first 15 minutes alone! Well worth viewing if you get the chance. The casting is soooo good. Thanks for your kind words, John. You really ought to see this one. SUCH a great film! I’m surprised it isn’t more famous. Love this post, especially the capitalized nuggets of advice: “Any Hope,” “Bigger Person,” “Brave Woman,”–perfect! Really enjoyed this! Thanks! I do get a bit carried away with capitalization because I find it very amusing. Ha ha! That is excellent! Well, if these things worked for Laraine Day, they should work for the rest of us. And yes – you MUST see The Locket. If this movie is half as good as your post/guide, I’ll be very happy. I don’t think I’ve ever seen Laraine Day in a femme fatale role – nor did I suspect she had it in her. Looking forward to checking out “The Locket” – and Laraine Day as a Man Eater. I KNOW!! Laraine Day as a femme fatale?! It sounds crazy, but she is sooo good. It’s her wholesome appearance that makes her more than a little creepy. Great job with this post. I love “The Locket” and think Day is amazing in it. She was underrated and under-appreciated while at MGM, but RKO gave her some meaty roles like this one. Loved the way you incorporated femme fatale characteristics and combined them with a movie review. Thanks for dropping by! 🙂 Yup, “The Locket” deserves more attention than it receives and Day’s performance is perfect. This post was amazing! I just wanted to say that I enjoyed it so much that I had to get my hands on the movie to watch, which I was finally able to do last night…and I really liked it. I’ve never seen a film noir quite like this one. The audience never sees her have a nasty moment; she is always so unwaveringly innocent in appearance. Usually, femme fatales telegraph that they are femme fatales, at least to the audience, if not to the men. I agree with you re: Laraine Day. She seems so wide-eyed and innocent, which probably makes her THE most dangerous femme fatale. I’m glad you had the chance to watch this underrated film.